This is a free mindfulness, meditation, and compassion-building tool for iPhone and iPad that has been developed to provide middle-school students, high-school students, and adults alike with a framework for developing a deeper sense of mindfulness and compassion, resulting in greater happiness and well-being. Over the years I’ve really had to learn the hard way how to deal with my stress, and more often than not, it simply boils down to catching oneself in the moment and following exactly what the title of this app says. Stopping, breathing, and really thinking can help you to develop your own sense of inner peace, and let’s face it, this is incredibly important in this hectic world we live in. When you first start using Stop, Breathe & Think, you’ll be given the choice to create a user account and input some of your personal details. You can, however, tap the Just Browsing button to take a look at the content if you’d rather get a feel for what it’s all about first. Once you get into the main interface you’ll see a few different options, and I would recommend starting with “How Are You?” This is a five-step process that lets you take a mental and emotional audit so that you can immediately become more mindful of what your thoughts and feelings are doing right now. From here you’ll be given a handful of useful suggestions for things that you can do to further develop your mental, emotional, and physical wellbeing so that you can build a more holistic approach to your general happiness and well-being. 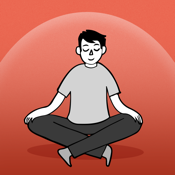 There are also sections such as Learn How to Meditate that will help you to get the most out of the medications contained within this app, and once you’re ready you can check out the List of Meditations to really dive in and start gaining a more comprehensive understanding of yourself. You can also check in with the My Progress section, which shows you information such as the stickers you’ve collected, how many consecutive days you’ve checked in for, and your Weekly Settledness. This provides a great snapshot of your wellbeing over the current seven-day period. Any tool or resource for iPhone and iPad that is aimed at furthering this way of thinking is one that gets my vote, so I would definitely recommend checking out Stop, Breathe & Think, regardless of your age and circumstances.